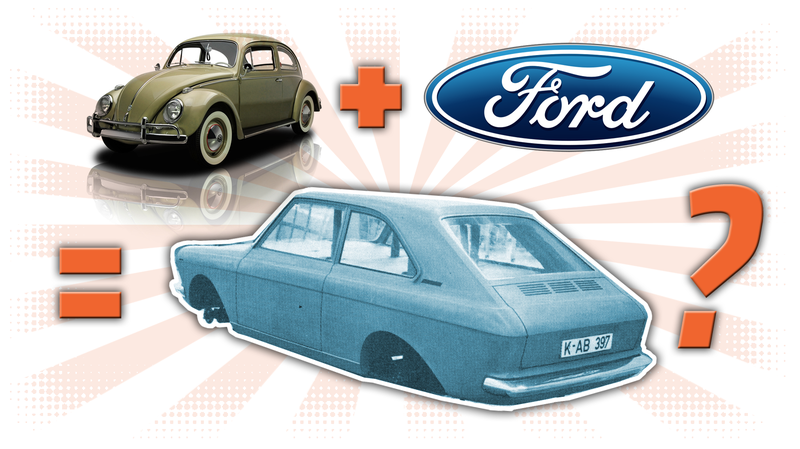 Right after WWII, Ford famously turned down the Volkswagen factory at Wolfsburg, which they could have had for free. In hindsight, I’m pretty sure there was some regret about that decision, and it’s also what makes the Ford NPX-5 prototype so delightfully slathered in irony. The NPX-5 was Ford’s attempt to make a better Beetle. This prototype was made in 1959, and was a direct response to the growing popularity of the Volkswagen Beetle in America, and, to a lesser extent, the Renault Dauphine. Henry Ford II was keenly aware of the Beetle, and wanted to make a new small car, worthy of the Model T, to compete with it. To do so, he contacted Ford’s subsidiary in Cologne, Germany, where Jules A. Gutzeit lead the project to create a prototype. The car they designed, the NPX-5, was rear-engined like the Beetle and the Dauphine, a layout that at that time seemed to be the most efficient way to design a small, inexpensive car. Front-wheel drive, transverse-engined cars were only just barely getting started in 1959, with Alec Issigonis’ Mini, and most of the mass-market small economy cars (almost all VWs, Fiat 500/600, Simca, Renault 4CV/Dauphine, etc) were looking to rear-engined designs. It makes sense that Ford would have considered the same, even if their rear-engine explorations were limited to some mid-‘30s experiments with the Lincoln Zephyr. The prototypes had two engine sizes, both inline-fours, and water-cooled, making them more Dauphine-like than Beetle-like. One was a 1-liter engine making 34 horsepower, and the other was a 1.2-liter brute cranking out a fearsome 40 HP. Both of these engines would have been roughly equivalent to VW engines of the era. What I find most striking about the Ford NPX-5 design, at least from the one solitary picture that seems to exist, is just how much it looks like VW’s Type 4 from about ten years later. That’s incredibly similar. Right down to body angles and character lines. I wouldn’t be shocked if you could swap engine lids on those two cars and have them bolt right on. I’m wondering if anyone from the NPX-5 project ended up working on the Type 4 – I’ll keep looking into that to see what I can find out. Did anyone at VW see this prototype being built? Really, it looks like to me that Ford designed the VW Type 4 ten years early, and then gave up on it. By February of 1960, Lee Iacocca, who was famously with Ford at the time, flew to Cologne to inspect the car, as he felt strongly that Ford needed a strong Beetle competitor as well. Unfortunately, he wasn’t happy with what he saw. He felt the design needed to be more like a conventional three-box sedan, and even with that change, felt the car was just too small for American tastes. That didn’t really explain why Americans were buying all those Beetles that they wanted to compete with, but Lee had his say and, along with projections that showed the P-4's cost would likely be significantly more than the Beetle, that was that. When Iacocca got back to Detroit, he cancelled the rear-engine car and shifted focus of the P-4 project to his ‘Cardinal’ project, which involved the development of front-engined, front wheel-drive economy cars, a move that history would eventually prove to be the correct path. That front-engined/FWD Cardinal wouldn’t ever be sold in America after all, but would get shipped to Germany, where it would become the Ford Taunus P4, with a V4 engine and FWD. So, Ford never really did manage to make that better Beetle, but they did manage to design the VW Type 4 a good decade before VW got around to it. That’s pretty good too, I suppose.